Fits all popular tablets, e-readers, cell phones: Apple iPad, iPad Air, iPad mini, iPhone, Microsoft Surface, Android, Amazon Fire, Kindle, Nook, Samsung, Nexus. The iPrep is an easy and secure way to support your tablet (hands free) throughout the home, on the go, traveling, camping, for RVS', for use with kids homework or accessing sports, YouTube, Netflix, Amazon, iTunes, and Videos. Integrated stylus pen stores in the base for convenient access; the iPrep is portable, compact and folds to fit any bag, backpack or purse. 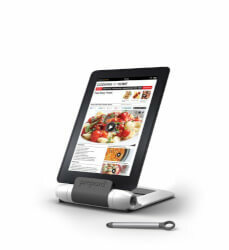 Four adjustable angles to position the tablet for ideal viewing; non-slip rubber grip on base; tablets can be placed in the iPrep vertically or horizontally. Comes packaged in a gift box and has a 5 year warranty.